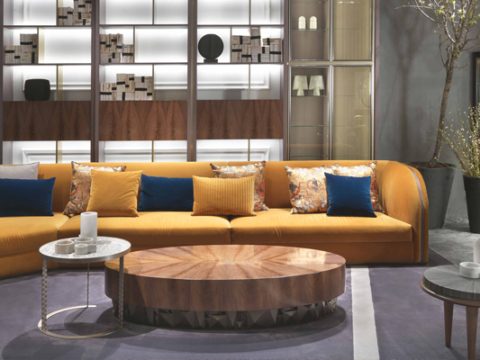 Salone del Mobile.Milano Shanghai has closed off a successful third edition at the SEC (Shanghai Exhibition Center) showcasing a selection of luxury Italian companies representing the best of Made in Italy. 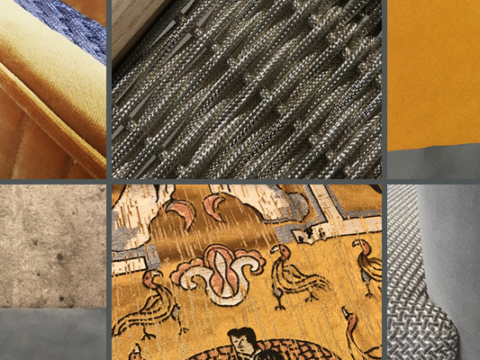 Inside this inner circle of top quality manufacturers, Elledue has showcased a selection of products coming from its iconic collections Ulysse, Penelope, Doge, and Caesar, designed by Alex Charles and Aqvila, designed by Walid Fleihan, all reinterpreted and revised to meet the Chinese taste and lifestyle. The space was divided into two different but coherent settings: a modern yet luxurious dining area and a cozy, colorful lounge. Set between the two areas was the flamboyant Aqvila armchair with its sinuous armrests, masterfully engraved with a 3d floral motif. On the walls, rich paneling mixing wood and brass details added a touch of sophistication, while casting an elegant reflection to both settings. The color palette was fresh and diverse, with macaron shades like mint green and candy pink, bold accents of red, dark wood veneers and warm greys. Metal details included natural brushed brass, warm gold and light silver finishings. A blend of rationalist reminiscences and glamorous mid 20th century style is what links the three main elements of the dining area: a majestic sideboard in Black wood from the Penelope collection with its matching round table, and a tall glass cupboard from the Ulysse collection. 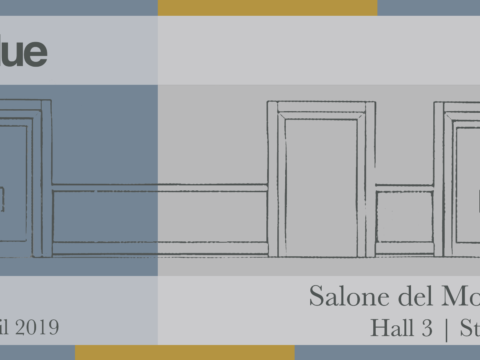 Sideboard and glass cupboard handles have been specifically customized on the occasion of Salone del Mobile.Milano Shanghai with an elegant brass motif recalling the traditional Chinese symbolism. 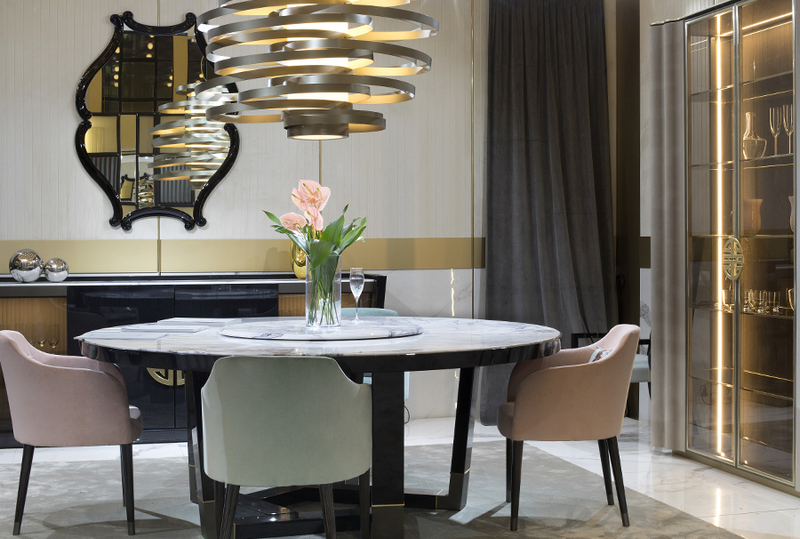 The Penelope table is undoubtedly the masterpiece of the setting: massive and graceful at the same time, is made precious by its Lilac marble top and the brass joints decorating its legs, looking bold but refined. The table is equipped with Lazy Susan and paired with comfortable chairs upholstered in soft velvet, with tiny and colorful decorative cushions. The lounge area looks impressive and bold: the two sofas, upholstered in smooth velvet and fine leather, both feature sinuous shapes and convey the same sense of balance and grace. The Doge sofa, with its clean lines and classic details, nicely contrasts with the rationalist inspiration of the Penelope sofa. Introduced here for the very first time, Penelope sofa is characterized by a rounded, enveloping shape and by a vertical matelassé motif on the back. Completely upholstered in leather, this piece looks contemporary and glamorous. Our signature metal Braid trimming, in a light silver finish, embellishes the upper edge of backrest and armrests and brings in an additional touch of sophistication. The deep red color of the Penelope armchair, designed in collaboration with Albodesign, vibrantly sparkles in the lounge, enhanced by its metal structure lacquered in a dark grey tone. The seat is enriched by a soft back cushion, while smaller decorative cushions, in a romantic nature-inspired jacquard fabric mixing light mint green and reddish tones, complete the piece and its color scheme. The atmosphere is made even more glamourous by a series of beautiful coffee and side tables.